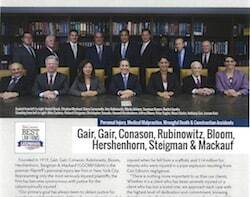 The New York Personal Injury Attorneys at Gair, Gair, Conason, Rubinowitz, Bloom, Hershenhorn, Steigman & Mackauf has won or settled a multitude of substantial cases in the recent past. 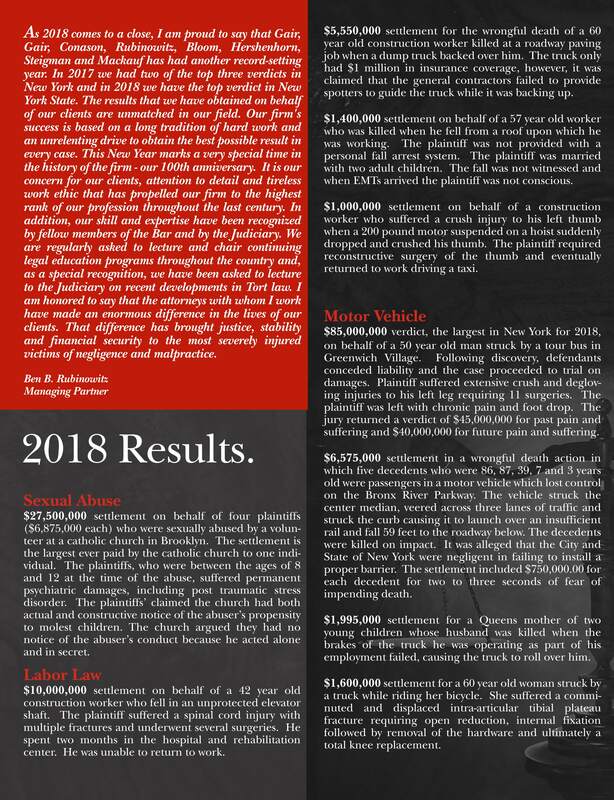 In September 2018, Ben Rubinowitz and Peter Saghir obtained a record setting $27.5 million settlement from the Diocese of Brooklyn on behalf of four boys who were sexually abused by a religion teacher. This is one of the largest settlement ever awarded to sexual abuse victims within the catholic church. 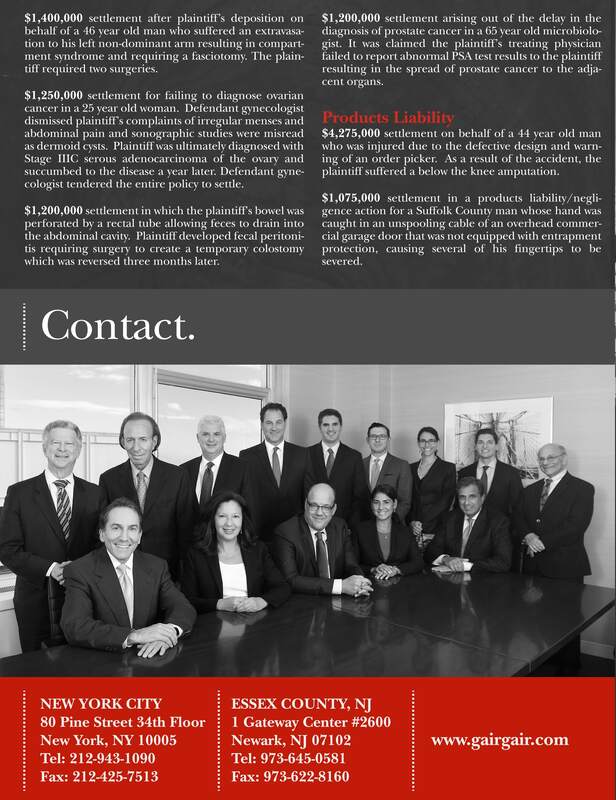 In the past year our firm obtained 2 of the top 3 personal injury verdicts in New York State. 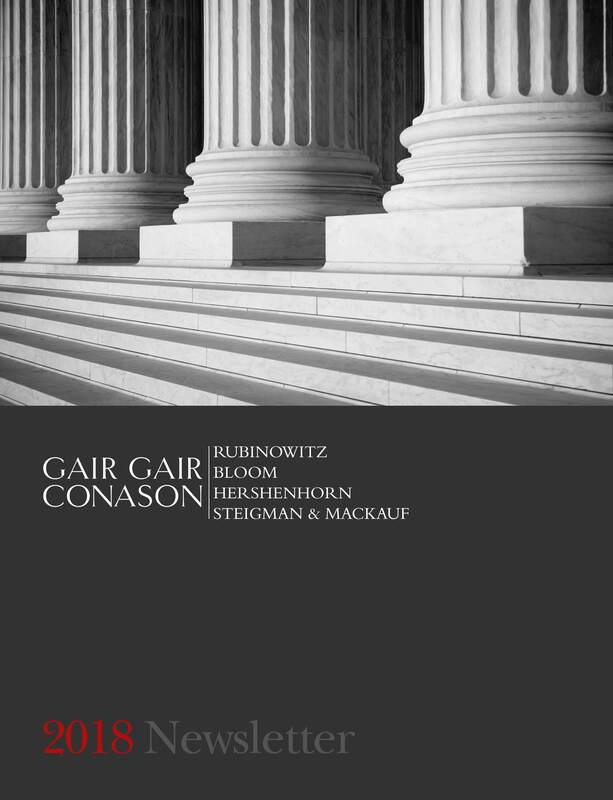 In the first case, Ben Rubinowitz, Rachel Jacobs and James Rubinowitz obtained a $71 million verdict for a former Cornell student who suffered a fracture of her Lumbar Spine in a car accident in New York. The victim is now able to walk with braces but still suffers from neurogenic bowel. She will need medical help for the rest of her life. The jury awarded $5 million for her past pain and suffering, 6 million for her future pain and suffering and 60 million for her future medical needs.. This verdict was also the highest car accident verdict in New York in 2017. A total of 6 of the verdicts obtained by our attorneys were listed in in the 2017 Top New York Verdicts and our firm is featured in the New York Magazine in New York's Leading Personal Injury Lawyers 2017. 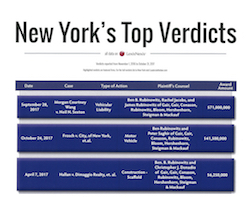 No other firm in New York had that many cases listed in the the 2017 Top New York Verdicts. The following is a small sample of notable settlements and verdicts obtained by our attorneys. These results demonstrate the excellent representation provided by our lawyers in a variety of case types. Our Personal Injury Firm has had the privilege of serving as lead counsel in some of the more prestigious class action litigations of the past 90 years. Below are some examples of its successes. $100,000,000 recovery for victims of 9/11 and their families. 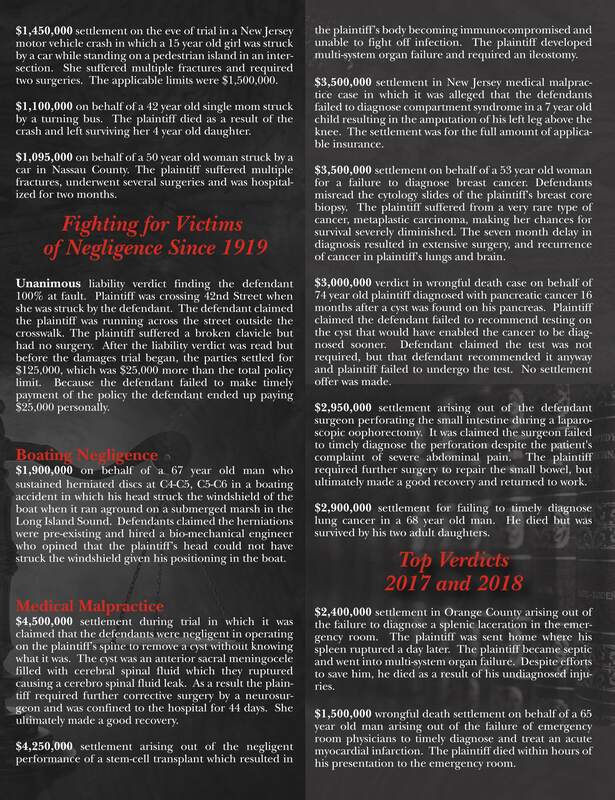 This strikingly large settlement was due, in large part, to our attorney's legal strategy and ability to convey the human nature of this immense tragedy to the Victim's Compensation Fund. The fire at Stouffer's Hotel in Westchester County. We represented the estates of 11 members of the Board of Directors of a Fortune 500 Company killed in the fire. The case settled for more than $50,000,000. The explosion on Ann Street that resulted in 12 deaths and multiple injuries. The case settled for $18,000,000. A building collapse on West 35th Street resulting in numerous injuries. The settlement was in excess of $3,000,000 (there was only $2,000,000 in insurance coverage). $3,000,000 settlement on behalf of the family of Amadou Diallo, which is believed to be the largest settlement ever under New York State's wrongful-death statute for a victim who earned less than $ 10,000 and had no dependents. $27,500,000 verdict for a pedestrian struck by a bus . The pedestrian suffered the loss of her leg. This is the largest verdict for such an injury in New York State history. $8,570,000 verdict for a bicyclist who suffered a degloving injury to her right leg as well as fractures to the distal tibia and fibula of her left leg after being struck by a MTA Bus in Manhattan. Read more about this case here. $8,000,000 settlement for a mother of a 4 year old child who killed by a drunk driver. This is the largest award in NY State for the death of a mother living one child surviving her. $8,000,000 settlement for a man who lost his wife as the result of the negligent behavior of a man who drove while intoxicated. $7,125,000 verdict for a 41 year old man who suffered knee injuries in a car accident that happened on the West Side Highway. This is the highest verdict for knees injury in New York Sate. $7,000,000 settlement for a 68 year old man who was struck by a bus that turned into him while he was crossing the street. The Judge stated that he believes this was the highest settlement ever in any case he has handled in the last 20 years in Morris County N.J.
$6,500,000 settlement for an 80 year old woman who was struck by a MTA bus. $5,000,000 settlement in a wrongful death case in which a bar permitted a man to continue to drink alcoholic beverages before he started driving. That man then drove while intoxicated, killing a father of two children. $5,000,000 recovery in New York County for the widow of a physician struck and killed by an N.Y.P.D. tow truck while he was riding his bike on the Green Way on the West Side when the truck made a right turn onto the path and crashed into him. The decedent was not wearing a helmet. $3,075,000 settlement on behalf of several children injured when a hayride went out of control and flipped over. $3,025,000 against Long Island Bus and The County of Nassau for a 9 year old boy with Down Syndrome who's mother was killed as she carried him across a Hempstead intersection when a bus collided with an suv that had run a red light. The bus driver and the municipal bus company were found liable (along with suv operator) and are responsible to pay the entire judgment. $2,750,000 verdict for a man who suffered injuries when a vehicle crossed into his lane of traffic. The City of New York was held 80% responsible (affirmed on appeal) for failing to have erected jersey barriers to prevent crossover accidents. $2,250,000 settlement for man suffering significant leg injuries when struck by a car . $2,075,000 settlement for a taxi passenger who was seriously injured after his cab was struck by a police car. $1,570,000 recovery for a woman who suffered serious injuries in an automobile accident. Although there was only $ 500,000 in Auto Insurance 1,000,000 was paid on a homeowner's policy as a result of proof of an improper disclaimer. $1,380,000 arbitration award in an automobile underinsurance claim stemming from injuries suffered in an auto accident. The injured woman had a fracture of a lumbar vertebra. $1,200,000 verdict for a man who suffered a herniated cervical disc when an adolescent dropped a pumpkin from an overpass onto the Long Island Expressway. $4,997,986 settlement on behalf of a Manhattan resident who sustained brain damage when a chain-link security fence fell off the roof of a five-story building and struck him on the head while he was walking down the street. $3,975,000 settlement in New York County for a man who fell from a truck and was impaled by a piece of Rebar. $2,975,000 settlement in a New York County construction accident case for a worker killed when a prefabricated wall panel fell on him. $2,975,000 recovery for a New York construction worker who suffered a serious injury to his foot requiring multiple surgeries while riding on a muck tram in a subway tunnel which struck a wall. $2,500,000 settlement on behalf of a sheet-metal worker who sustained a crushed pelvis when the unsecured arm of a sign that was being hoisted became dislodged and struck him. $2,200,000 settlement in a construction accident case on behalf of a laborer killed in a construction accident. 12,400,000 settlement for the wrongful death of a 40 year old woman who died in a gas explosion that took place in her house in Floral Park, Queens, New York. $4,200,000 settlement in a products liability case for a man who was burned when his fuel tank exploded following an auto accident . $2,000,000 settlement in a products liability action in Bronx County on behalf of 9-year old boy who lost sight in his eye due to a defective toy mirror when the glass portion of the minor came out of the plastic housing which had been defectively constructed. The corner of the glass struck one of the boy's eyes resulting in permanent blindness in the eye. A confidential but substantial settlement in Joan Rivers Medical Malpractice case. The comedian died after doctors performed an unauthorized biopsy on her throat during a routine endoscopy. $103,000,000 verdict (one of the largest ever) in a Broome County medical malpractice case on behalf of a baby brain damaged at birth . $9,400,000 in a Manhattan medical malpractice case in which a woman suffered brain damage following ambulatory gynecologic surgery in which doctors failed to properly monitor her post-operative course in which she suffered an anoxic event that was not timely treated. $8,000,000 settlement for a woman in case in which doctors and hospital employees failed to timely diagnose a valvulus (twisting of the intestine) in a woman which caused multiple surgeries and hospitalizations and the need for an intestinal transplant. $8,000,000 settlement on behalf of an 18-year old boy in a New York medical malpractice lawsuit where a physician prescribed the medication Depakote without monitoring the boy's liver function despite the known effects of Depakote on the liver. As a result of the failure to monitor the liver function, the plaintiff sustained complete liver failure requiring a liver transplant and hepatic encephalopathy resulting in brain damage. $8,000,000 settlement in a Nassau County medical malpractice case for a child rendered brain damaged with cerebral palsy as a result of negligent obstetrical care given to the baby's mother. $6,800,000 settlement in a medical malpractice case involving a six year old child whose bacterial infection was not diagnosed and resulted in the loss of a leg. $6,000,000 settlement in Onondaga County for a child rendered brain damage as a result of medical malpractice in the obstetrical care rendered to the baby's mother. $5,995,000 for a young boy in New York County who sustained a brain injury as a result of a pharmacy error in a case involving total parenteral nutrition (TPN) which was mixed with 10 times too much dextrose and which was delivered to the child's home by an out of state pharmacy and administered by a private duty nurse. $5,000,000 recovery for a Connecticut man injured when he fell while awaiting treatment at a hospital. $4,000,000 recovery in a medical malpractice for the failure to diagnose a an epidural hematoma causing brain damage. $3,500,000 settlement on behalf of a man injured as a result of improper administration of an anesthetic . $3,000,000 recovery in a medical malpractice for an 18 year old girl who lost her leg as a result of a physician's malpractice in failing to diagnose a pseudoaneurism of the popliteal artery following an ACL repair. This was the full amount of insurance coverage. $3,000,000 settlement for a brain damaged baby due to obstetrical malpractice. This was the total available proceeds from the municipality. $2,500,000 verdict for a woman who suffered a perforation of her dudodenum during an Upper Endoscopy performed in Queens, NYC (see more here). $2,500,000 verdict in a Rockland County medical malpractice case in which a gynecologist transected a 68 year old woman's ureter resulting in the loss of a kidney. $2,450,000 settlement in a medical malpractice for the family of a Westchester County man who died as a result of a medical group's malpractice in failing to timely diagnosis and treat his heart condition which led to a fatal heart attack. $2,400,000 on behalf of the widow of an unemployed 39 year old man who died after a Uvuloplasty when the nurse failed to follow the doctors instructions to properly monitor the patients oxygen saturation. The nurse claimed that the doctor's orders were unclear. $2,250,000 settlement in a legal malpractice case for a man who hired a law firm to represent him in an action against his doctor for losing a kidney. The firm was negligent in their representation of their client and as a result of the lawyer's oversight, the medical malpractice case was dismissed. $2,175,000 on behalf of a man whose wife died because her doctors failed to diagnose her benign meningioma. $2,175,000 settlement in a medical malpractice case in which it was claimed that there was a failure to diagnose a meningioma. $2,150,000 settlement in Nassau County for a prostate cancer patient that developed a fistula after a radical prostatectomy. 2,100,000 settlement for a who was injured during a robotic surgery for prostate cancer. $2,000,000 settlement on behalf of a young man whose wife died due to negligent anesthesia care during a routine D & C.
$2,000,000 settlement in a medical malpractice case involving the failure to diagnose breast cancer . $1,900,000 settlement in a Richmond County medical malpractice case in which doctors failed to diagnose preeclampsia in a woman who suffered from cerebral bleeding a few days after giving birth. $1,800,000 verdict in a medical malpractice case for a young boy who suffered an Erb's Palsy due to the doctor's negligence during delivery. $1,750,000 settlement in a medical/dental malpractice case involving failure to prevent bacterial endocarditis. $1,750,000 verdict in a medical malpractice case for a woman injured by a doctor's negligent placement of an aortobifemoral bypass graft causing injury to her bowel. $1,600,000 settlement in a medical malpractice case involving the failure to take an adequate biopsy of a patient's ulcer and thereby failed to diagnose gastric cancer . $1,600,000 settlement in a medical malpractice case in which a gynecologist failed to perform a prophylactic oophorectomy on a woman who developed ovarian cancer and who had suffered breast cancer and had a positive family history of ovarian cancer. $1,600,000 recovery for a New York County 74-year-old woman whose lung cancer was undiagnosed but appeared in a routine chest x-ray. $1,600,000 settlement in a medical malpractice case settlement for a child who suffered Erb's Palsy following negligent delivery by his mother's obstetrician. $1,600,000 verdict for a young man with a severe congenital hearing loss whose doctors committed malpractice resulting in the loss of his remaining hearing. $1,575,000 verdict on behalf of a woman whose doctors failed to make a timely diagnosis of her breast cancer . $1,450,000 for a woman whose doctors were negligent in failing to diagnose her breast cancer . $1,450,000 settlement in an Ulster County medical malpractice case in which doctors failed to timely diagnose a woman's breast cancer. $1,450,000 settlement in a Dutchess County medical malpractice case in which doctors failed to timely diagnose breast cancer . $1,200,000 on behalf of a middle aged man who suffered a bowel perforation during a colon resection at a major Manhattan hospital and required further surgery and a colostomy for a period of time. $1,000,000 recovery in a New York medical malpractice case for failure to diagnose Crohn's Disease. $1,000,000 settlement on behalf of a young boy whose doctors failed to diagnose an osteomyelitis infection of his hip. $1,000,000 settlement on behalf of a man whose doctors failed to diagnose prostate cancer . $1,000,000 settlement for a man who developed severe bed sores due to nursing home malpractice . $1,000,000 settlement (insurance policy limits) on behalf of a woman whose husband died because his doctor failed to timely diagnose lung cancer . $1,000,000 settlement (insurance policy limits) on behalf of a man whose doctors failed to diagnose colon cancer. $1,350,000 verdict for a man who suffered loss of vision in one eye and decreased vision in the other eye as a result of his doctor's failure to treat proliferative diabetic retinopathy. A $27,500,000 settlement against the catholic church on behalf of four victims who were sexually abused by a Angelo Serrano, a worker at St. Lucy's St. Patrick's, a Catholic church in the Clinton Hill section of Brooklyn. The Diocese of Brooklyn and Queens and a local after school program will pay $27,500,000 which will be divided evenly with each boy receiving $6,875,000. This is the largest settlement in the country paid by the Catholic Church to an individual survivor of sexual abuse. $12,400,000 settlement for a mother of three children who died in a house explosion after Con Edison failed to evacuate it in light of a known gas leak. $11,400,000 verdict for two teenagers who were sexually abused by the youth minister of their Parrish.